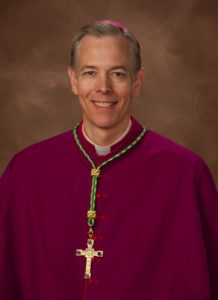 Archbishop Alexander K. Sample was born on November 7, 1960 in Kalispell, MT. He graduated from Bishop Gorman High School, Las Vegas, NV, in 1978. He earned a Bachelor of Science degree in Metallurgical Engineering in 1982 and a Master of Science degree in Metallurgical Engineering in 1984, both from Michigan Technological University. He completed studies in Philosophy at the College of St. Thomas in St. Paul, MN in 1986. He then studied at the Pontifical College Josephinum Seminary in Columbus, OH, where he earned a Master of Divinity degree in 1990. He was ordained a priest at St. Peter Cathedral in Marquette, MI on June 1, 1990. Father Sample served as Associate Pastor at St. Peter Cathedral from 1990 until 1993. From 1993 until 1994 he served as Pastor at St. George Parish, Bark River, MI, at Sacred Heart Parish in Schaffer, MI and at St. Michael Parish in Perronville, MI. He studied Canon Law at the Pontifical University of St. Thomas Aquinas (the Angelicum) in Rome from 1994 until 1996. From 1996 – 2006, Father Sample served in the Diocese of Marquette as Chancellor, Director of Ministry and Priest Personnel, as member of the College of Consultors, and as Executive Director of the Bishop Baraga Association. He was appointed Bishop of Marquette on December 13, 2005 by Pope Benedict XVI, and was ordained a Bishop on January 25, 2006. He was appointed the eleventh Archbishop of Portland in Oregon on January 29, 2013, and was installed on April 2, 2013.